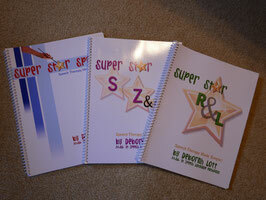 3 Book Set including Super Star Speech, Super Star R & L, and Super Star S, Z, & Sh. This set of three books contains about 90% of the content of Super Star Speech: Expanded Edition. The format is somewhat different since the content is spread through 3 volumes, but this is a great way to get a lot of material at a bargain price!